It’s no secret that Boston is in a real estate boom. Real estate activity along with increased business activity has led to higher demand for commercial new construction projects. Here’s a quick look at factors that contribute to new construction initiatives and how builders are altering their approach and practices to adjust to changing times. As mentioned in our blog from last week, Boston maintains low vacancy rates yet extraordinarily high rent increases for commercial office space, far above the national average. Part of the rate increases are attributed to the introduction of new and more modern office buildings. Yet even with the addition of more inventory, vacancy rates have remained steady, demonstrating that demand is equally rising. Watch the news on any given day and you’ll likely hear a story about another business looking to expand into the Boston market. Such conditions naturally spur commercial new construction projects in and around the city. 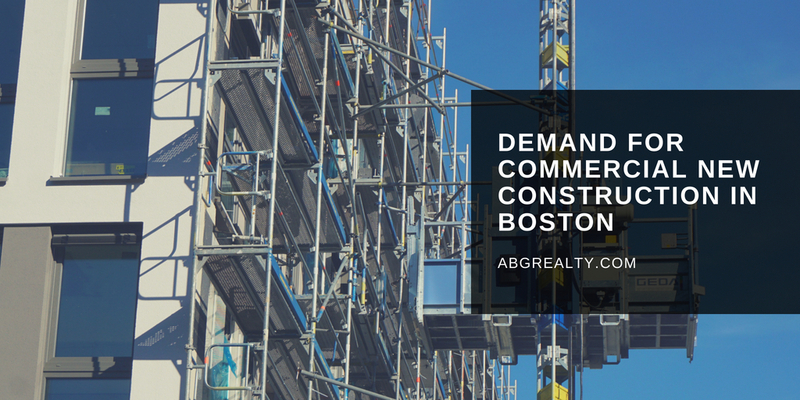 According to the Boston Globe, builders in the area have traditionally taken a very cautious and conservative approach to commercial new construction projects. Most would not break ground until receiving lease commitments for at least half of the space. However, with such high demand and market certainty, those same builders are starting construction much sooner. Doing so is less risky than before and has the potential for big returns. Why Commercial New Construction Projects Are Appealing? Boston is becoming more and more technology oriented in both the types of businesses that operate here and in the population of workers. Tech-oriented companies are attracted to new and modern spaces that reflect their company image and appeal to their desired worker base. With Boston being an old city, renovation and new construction is necessary to meet these demands. If you would like to expand your commercial real estate investments, contact our team. We specialize in office, retail and industrial commercial real estate throughout Greater Boston and Eastern Massachusetts.